Everything is crafted by hand in sunny San Diego & Orange County, California. We LOVE what we do and find joy in hand making each piece one at a time. Monkeys Always Look is also the originator of the Silverware Garden Markers. We have a broad selections of gifty products including jewelry, table top gifts and garden accessories. Booth 1146. You will get 5% off your order total (exclude shipping) OR free shipping (which ever is more) if you mention this show special at the show at the time of order placement. A perfect birthday gift for anyone! Vintage Silverware wedding decoration or photo prop. 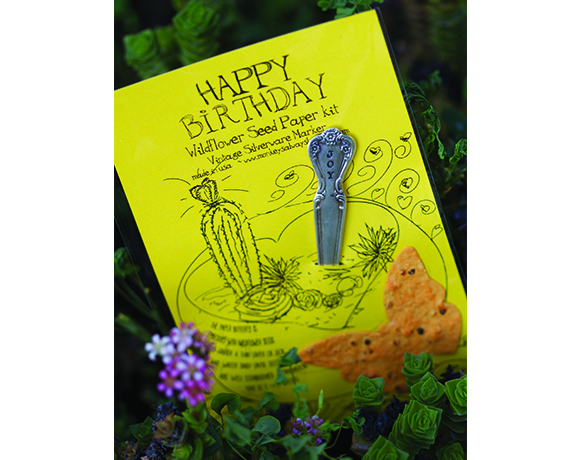 These silverware garden marker are best for wedding photo props, decorations, or whatever else you can think of! Vintage Silverware wedding decoration or photo prop. 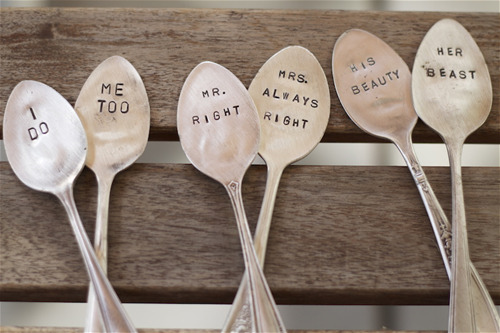 These silverware garden markers are best for wedding photo props, decorations, or whatever else you can think of! Silverware spoons sizes varies (teaspoons, tablespoons, soupspoons etc) and the vintage pattern can't be garanteed. That's part of the beauty of vintage and unique gifts! 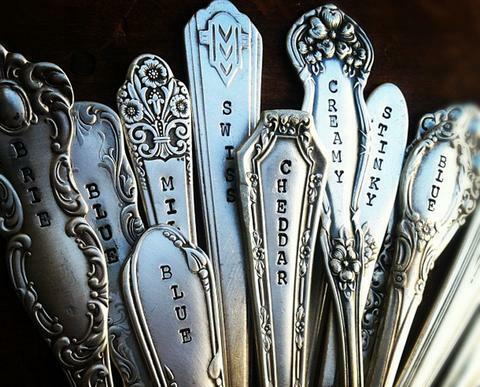 Spoon handle cheese markers. 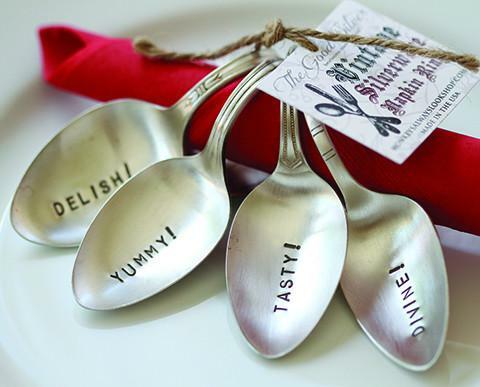 Single custom pieces hand stamped into each unique antique or vintage silverplated spoon handle. You choose what you would like stamped on each piece. This listing is for one piece. Each piece has a soft brush finish. Add some whimsy to your home decor with these inspirational/funny vertical garlands. 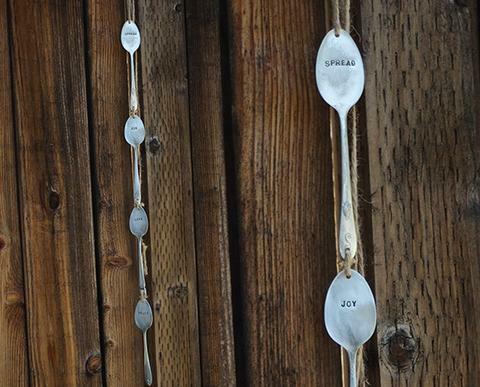 Each word is stamp on each spoon and hang together with thick twine. 2. 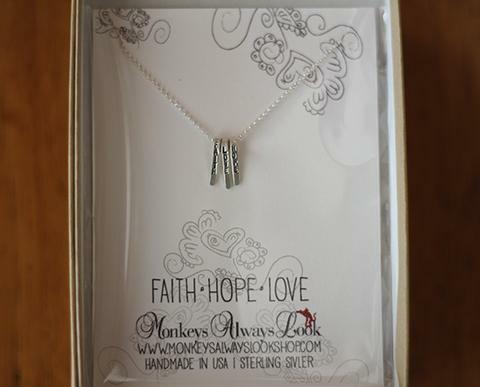 A special quote on the card: "Faith Hope Love"
Card Dimension: 3.5" x 5"